For other uses, see Oban (disambiguation). 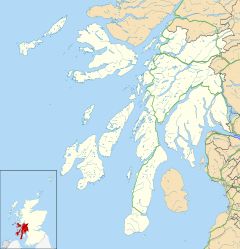 Oban (/ˈoʊbən/ ( listen) OH-bən; An t-Òban in Scottish Gaelic meaning The Little Bay) is a resort town within the Argyll and Bute council area of Scotland. Despite its small size, it is the largest town between Helensburgh and Fort William. During the tourist season, the town can play host to up to 25,000 people. Oban occupies a setting in the Firth of Lorn. The bay is a near perfect horseshoe, protected by the island of Kerrera; and beyond Kerrera, the Isle of Mull. To the north, is the long low island of Lismore, and the mountains of Morvern and Ardgour. The site where Oban now stands has been used by humans since at least mesolithic times, as evidenced by archaeological remains of cave dwellers found in the town. Just outside the town stands Dunollie Castle, on a site that overlooks the main entrance to the bay and has been fortified since the Bronze age. Prior to the 19th century, the town itself supported very few households, sustaining only minor fishing, trading, shipbuilding and quarrying industries, and a few hardy tourists. The Renfrew trading company established a storehouse there in about 1714 as a local outlet for its merchandise, but a Custom-house was not deemed necessary until 1736 when "Oban being reckoned a proper place for clearing out vessels for the herring fishery". The modern town of Oban grew up around the distillery, which was founded there in 1794. The town was raised to a burgh of barony in 1811 by royal charter. Sir Walter Scott visited the area in 1814, the year in which he published his poem The Lord of the Isles; interest in the poem brought many new visitors to the town. The town was made a Parliamentary Burgh in 1833. A rail link - the Callander and Oban Railway - was authorised in 1864 but took years to reach the town. The final stretch of track to Oban opened on 30 June 1880. This brought further prosperity, revitalising local industry and giving new energy to tourism. Also at this time work on the ill-fated Oban Hydro was commenced but abandoned, and left to fall into disrepair, after 1882 when Dr Orr, the schemes originator, realised he had grossly underestimated its cost. Work on McCaig's Tower, a prominent local landmark, started in 1895. It was paid for by John Stewart McCaig (1824-1902) and was constructed, in hard times, to give work for local stone masons. However, its construction ceased in 1902 on the death of its benefactor. During World War II, Oban was used by Merchant and Royal Navy ships and was an important base in the Battle of the Atlantic. The Royal Navy had a signal station near Ganavan, and an anti-submarine indicator loop station, which detected any surface or submarine vessels between Oban, Mull and Lismore. There was a controlled minefield in the Sound of Kerrera, which was operated from a building near the caravan site at Gallanach. There was also a Royal Air Force flying boat base at Ganavan and on Kerrera, and an airfield at North Connel built by the Royal Air Force. A Sector Operations Room was built near the airfield; after the war, this was extended to become the Royal Observer Corps Group HQ. Oban was also important during the Cold War because the first Transatlantic Telephone Cable (TAT-1) came ashore at Gallanach Bay. This carried the Hot Line between the US and USSR presidents. At North Connel, next to the airfield/airport was the NRC (Nuclear Reporting Cell) of the Royal Observer Corps (29 October 1925 to 31 December 1995). Since the 1950s, the principal industry has remained tourism, though the town is also an important ferry port, acting as the hub for Caledonian MacBrayne ferries to many of the islands of the Inner and Outer Hebrides. As with the rest of the British Isles, Oban experiences a maritime climate with cool summers and mild winters. The nearest official Met Office weather station for which online records are available is at Dunstaffnage, about 2.7 miles (4.3 km) north-north-east of Oban town centre. Rainfall is high, but thanks to the Gulf Stream, the temperature seldom falls below 0 °C (32 °F). The local culture is Gaelic. In 2011, 8.2% of the town's population over age 3 could speak Gaelic and 11.3% had some facility in the language. Oban is considered the home of the Royal National Mòd, since it was first held there in 1892, with ten competitors on a Saturday afternoon. The town hosted the centenary Mod in 1992 (the year it became Royal) and in 2003 the 100th Mod, the two events attracting thousands of competitors and visitors (the 100th Mod was later than the centenary because it was not held in the war years). The Mod is held in Oban roughly every 6–8 years, and has last been held in October 2015. An annual Highland Games, known as the Argyllshire Gathering, is also held in the town. The Corran Halls theatre acts as a venue for community events, local and touring entertainers, and touring companies such as Scottish Opera. The town has a two-screen cinema, which closed in early 2010. Thanks to a local community initiative supported by a number of famous names, it reopened in August 2012 as the Phoenix Cinema. Oban has itself been used as a backdrop to several films, including Ring of Bright Water and Morvern Callar. The Oban War and Peace Museum advances the education of present and future generations by collecting, maintaining, conserving and exhibiting items of historical and cultural interest relating to the Oban area in peacetime and during the war years. A museum also operates within Oban Distillery, just behind the main seafront. The distillation of whisky in Oban predates the town: whisky has been produced on the site since 1794. The Hope MacDougall collection  is a unique record of the working and domestic lives of people in Scotland. Music is central to Gaelic culture, and there is lively interest in the town. In the 2010 pipe band season, the local Oban High School Pipe Band, led by Angus MacColl, was successful in winning the World Pipe Band Championships in Glasgow, the Cowal Games competition, and the Champion of Champions for the year in the novice-juvenile grade. The town also boasts a successful senior pipe band. The local Gaelic choir competes regularly and successfully in the Mod. During the 2011 Guy Fawkes Night, Oban became briefly infamous for its fireworks display, which became a worldwide news and online hit when £6,000 of display fireworks were ignited all at once due to a computer error. The display, which was due to last 20–30 minutes, was over in less than a minute. Pyro1, the company putting on the display, later apologized to the town by providing a free fireworks show. The town has been the birthplace and home of a number of well-known people. Oban Bay from McCaig's Tower. The bay is sheltered by the island of Kerrera. Behind lies the Isle of Mull. Oban and bay at night, note McCaig's Tower is illuminated. The area around Oban is rich with attractions for tourists, from the dramatic scenery of the coast and mountains to the fascinating histories of the local castles and ancient religious sites. There are also many activities available for families and those interested in more active pursuits. The Oban and Lorn tourist information website has detailed information for visitors. The Oban Visitor Information Centre, operated by VisitScotland, is located in the Columba Buildings on the North Pier. Oban lies at the western end of the A85 road. It also has a railway station from where a number of Abellio ScotRail trains run to and from Glasgow Queen Street daily. The town is also an important ferry port: it is Caledonian MacBrayne's busiest terminal. Oban is known as the "Gateway to the Isles", with ferries sailing to the islands of Lismore, Colonsay, Islay, Coll, Tiree, to Craignure on Mull, to Castlebay on Barra and to Lochboisdale on South Uist. In 2005, a new ferry terminal was opened, and in 2007 a second linkspan opened, allowing two vessels to load/unload at the same time. Scottish Citylink run buses from Glasgow's Buchanan bus station several times a day; in summer, buses run from Dundee via Perth (route 973) and to Edinburgh via Stirling (route 978). West Coast Motors operate many local services and also coach links as far south as Lochgilphead and as far north as Fort William. Oban has an airport outside the village of North Connel, some 5 miles NE of the town. In 2007, a further airlink was created between Oban and west-central Scotland: seaplanes fly from Glasgow city centre's Seaplane Terminal off the Clyde to the bay in Oban. Oban has a primary school campus located in the south of the town along with Park Primary School at the north of the town, and a major high school, Oban High School. Secondary school pupils are drawn from a wide surrounding catchment area, with some pupils having long commutes to and from school every day. Students who live on surrounding islands such as Coll or Mull stay at a local hostel during the school week. The school funds the hostel so that the families of the students don't have to pay themselves. The building formerly used as Rockfield Primary School has now been taken over by the Community and is being extensively refurbished. Oban is served by Kilmore & Oban Parish Church of the Church of Scotland. There are two church buildings in the united parish, namely at Glencruitten Road as well as Kilmore Church. The minister (since 2007) is the Rev. Dugald Cameron, who formerly served at St. John's Renfield Church, Glasgow. A third church, the former Corran Esplanade Church (opened in 1957 as Christ Church) at Corran Esplanade in the town, is now closed. The mother church of the Roman Catholic Diocese of Argyll and the Isles is St Columba's Cathedral at the north end of the Esplanade. During the 19th century, the Rector of the Pro-Cathedral was Father Allan MacDonald, a poet and Gaelic scholar. The present cathedral was designed by Sir Giles Gilbert Scott and constructed between 1932 and 1959. The Scottish Episcopal Church is represented in Oban by the Cathedral Church of St John the Divine, situated in George Street. 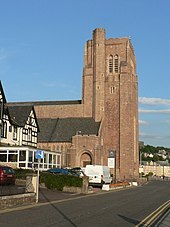 It is one of two cathedrals of the united Diocese of Argyll and the Isles, the other being the Cathedral of the Isles in Millport, Isle of Cumbrae. There are several other churches in the town, including the Free Church of Scotland in Rockfield Road, the Baptist Church in Albany Street, Salvation Army in Stevenson Street, Elim Pentecostal Church in Soroba Road, The Church of Jesus Christ of Latter-day Saints and the Lorn Christian Fellowship (Independent) both of whom meet at Oban High School and the Associated Presbyterian Church in Campbell Street. The Congregational Church in Tweedale Street was built in 1880. A Kingdom Hall of Jehovah's Witnesses is located nearby at 57 Lorn Road, Dunbeg. The local amateur football team is Oban Saints with a small stadium situated in Mossfield. However, shinty is a more popular game locally, with two major teams, Oban Camanachd and Oban Celtic, in the town. The Oban Times runs a "Spot the Shinty Ball" competition each week. Oban Cricket Club was formed in 2003 and plays in nearby Taynuilt. Oban Lorne Rugby Football Club turned 50 years old in 2012, and competes in the RBS West region. The Highlanders were a World Wrestling Entertainment wrestling tag-team originally from Oban. Oban Golf course was designed by professional golfer James Braid in the early 1900s, and offers a challenging 18 holes across difficult terrain. The West Highland Tennis Championships are held annually in July and attract some of Scotland's best players to the town. Past champions include Colin Fleming and Judy Murray. Oban also has a thriving martial arts scene, with karate, kick boxing, mixed martial arts, and boxing all available. Watersports are an obvious activity in a seaport, and sailing is very popular. West Highland Week  brings sailors from around the world to the town every year. Scuba diving is also readily available. The wreck diving is spectacular, with the Sound of Mull offering some truly world-class dive sites. Although weather and visibility can be variable, the local geography means that a dive somewhere can always be achieved. Laurinburg, North Carolina (United States) became a sister city to Oban in 1993. The initial agreement was between Scotland County, North Carolina, and Argyll & Bute District Council. Following reorganisation in 1995, the agreement was confirmed by Argyll & Bute Council in 1997. In 1997 Oban was also twinned with Gorey, County Wexford, in Ireland. ^ John Butler. "Pronunciation of Scotch Whiskys". School of Informatics, University of Edinburgh. Retrieved 12 October 2014. ^ The Royal Commission on the Ancient and Historical Monuments of Scotland (1974). Argyll, An Inventory of the Ancient Monuments, Volume 2 Lorn. HMSO. ISBN 0 11 491147 9. ^ "Dunollie Castle | Canmore". canmore.org.uk. Retrieved 11 April 2018. ^ "History of Oban". Oban Tourist Information Centre. ^ "Oban History". The Gazetteer for Scotland. ^ "The Hydro -- Oban Hydropathic Establishment and Sanatorium-". www.obanargyll.com. Retrieved 11 April 2018. ^ "Dunstaffnage 1971-2000 averages". Met Office. Archived from the original on 19 October 2011. Retrieved 2 November 2011. ^ "Oban weather records". Weatherbase. Retrieved 23 November 2011. ^ 2011 Scotland Census, Table QS211SC. ^ "Oban Games - Information about The Oban Games". ^ "The Corran Halls - Oban". Argyll and Bute Council. 6 December 2010. ^ "Dame Judi Dench in bid to save Oban cinema". BBC News. 17 February 2011 – via www.bbc.co.uk. ^ "Scotland the Movie Location Guide - Oban". ^ "Oban Distillery - The Distilleries of Scotland - scotchwhisky.net". www.scotchwhisky.net. ^ "Dunollie House Oban :: O, A, J". ^ "Oban Pipe Band on top of the world". 20 August 2011. ^ "Oban Gaelic Choir". www.obangaelicchoir.co.uk. ^ Mullen, Scott (8 November 2011). "Fireworks company to put on free show to make up for display which lasted just 50 seconds because of computer error". ^ "A SCOTS town's bungled firework display has become a YouTube sensation — after the £6,000 display lasted less than a MINUTE". ^ "Oban & Lorn Tourism Alliance :: Home". ^ "Visit Oban: The Gateway to the Isles - Scotland blog - By Scotland Channel". ^ Council, Argyll and Bute (21 December 2010). "Oban Airport Information". Argyll and Bute Council. Retrieved 11 April 2018. ^ "Rockfield Primary School (Former), Rockfield Road, Oban | Buildings at Risk Register". www.buildingsatrisk.org.uk. Retrieved 11 April 2018. ^ "Kilmore & Oban Church of Scotland". ^ "Oban, Corran Esplanade, Christ Church Dunollie | Canmore". canmore.org.uk. Retrieved 11 April 2018. ^ "Argyll Square Church (C) Gerald England". www.geograph.org.uk. Retrieved 11 April 2018. ^ "St. John - An Online Cathedral For St John The Apostle". Archived from the original on 3 August 2010. ^ "50th Birthday Celebration for Oban Lorne". ^ "Oban Golf Course, Argyll, Scotland, Glencruitten Golf Club". ^ "West Highland Tennis Week". ^ "West Highland Yachting Week". ^ "Gorey Town Twinning". Gorey Town Council. Retrieved 10 June 2014. Hughes, Mike, The Hebrides at War. Canongate Books, 1998, ISBN 0-86241-771-6. Batstone, Stephanie, Wren's Eye View, The Adventures of a Visual Signaller, Parapress Ltd, 1994, ISBN 1-898594-12-0. Written by a Wren based in Oban for most of WWII. Wikivoyage has a travel guide for Oban. Wikimedia Commons has media related to Oban. This page was last edited on 9 April 2019, at 22:10 (UTC).